This third volume completes the first part of the project " Macromolecular Physics." The first volume dealt with the description of macromolecular crystals; the second volume dealt with crystal growth; and the third volume summarizes our knowledge of the melting of linear, flexible macromolecules. 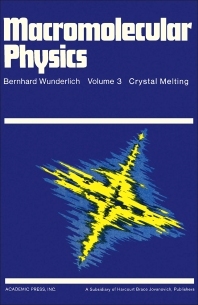 The discussion in the three volumes goes from reasonably well-established topics, such as the structure, morphology, and defects in crystals, to topics still in flux, such as crystal nucleation, detailed growth mechanisms, and annealing processes, to arrive at the present topics of equilibrium, nonequilibrium, and copolymer melting. Our knowledge is quite limited on many aspects of these latter topics. Professors and Students in the study of Macromolecular Physics. List of Tables. Preface. Acknowledgments. Contents of Volumes of 1 and 2. Equilibrium Melting. Irreversible Melting. Copolymer and Isomer Melting. Author Index. Subject Index.